A crescent shaped scar on the earth’s crust marks the location of the deepest known part of the world’s ocean. With some areas reaching depths more than 36,000 feet, scientists rely on a range of pioneering deep-sea technologies to survey the unexplored regions of the Mariana Trench. In 1987, the submersible Alvin was the first to visit the nearby Mariana Back-arc, a zone of highly active submarine volcanism and hydrothermal vents hidden 13,000 feet below the ocean’s surface. After returning to the Back-arc 30 years later equipped with the Schmidt Ocean Institute’s new underwater vehicle SuBastian, scientists can now fill gaps in our understanding about the biogeography of these unique ecosystems and to identify possible new species thriving in this extreme deep-ocean environment. This tectonic environment is unlike anywhere else on earth, providing a range of geophysical and geochemical conditions for chemosynthetic organisms, and supporting a surprisingly diverse biological community on the seafloor. In the Mariana region, only the Volcanic Arc has been systematically explored for hydrothermal vents. Scientists discovered 20 hydrothermally active seamounts and more than 20 new species exclusive to the area. Yet, more than 600 km of the Mariana Back-arc still remain uncharted. 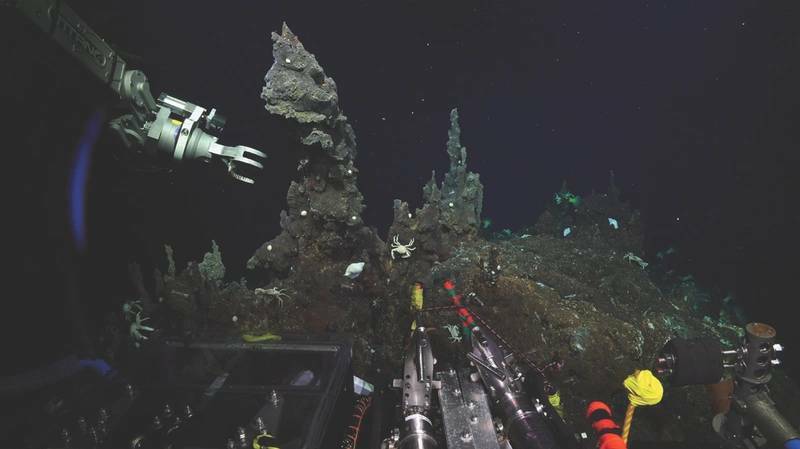 “From the previous exploration, we know that about a third of the seamounts in the Mariana Volcanic Arc are hydrothermally active, but the Mariana Back-arc has never been systematically explored, so we know much less about the activity there. How many hydrothermal vent sites are there in the Mariana Back-arc? Where are they located? What is their chemical input into the ocean? What is their role in the biogeography of vent animals in the western Pacific? Do the different tectonic settings of the Arc and Back-arc affect the character of the vents they host? We should now have the answers to some of these questions, and a starting point for answering the rest,” said Chadwick. The first phase of the two-part exploration of the region took place in December 2015 onboard research vessel Falkor. Principal Investigator Joseph Resing, of the University of Washington, led a 27-day mission to the Back-arc with researchers from the University of Washington, Oregon State University and NOAA-PMEL. 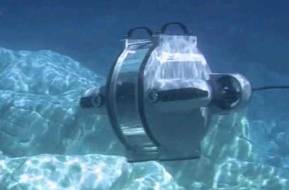 A vital member of the team was the autonomous underwater vehicle (AUV), Sentry. The Sentry AUV carried instrument packages consisting of optical and chemical sensors and surveyed systematically for hydrothermally active areas. Three new hydrothermal vent sites were discovered, one being the third deepest in the world. 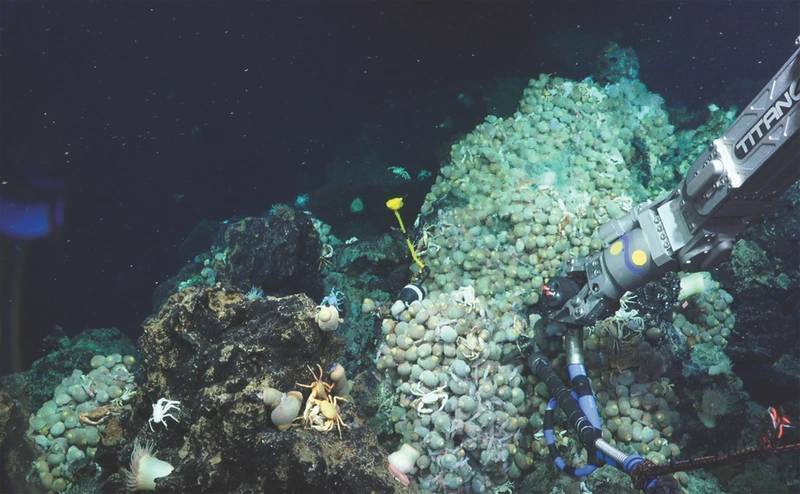 “At the end of the first expedition, we knew there were vent sites on the seafloor, but we had little or no information about what the sites looked like, what animals lived there or the chemical character of the vents. 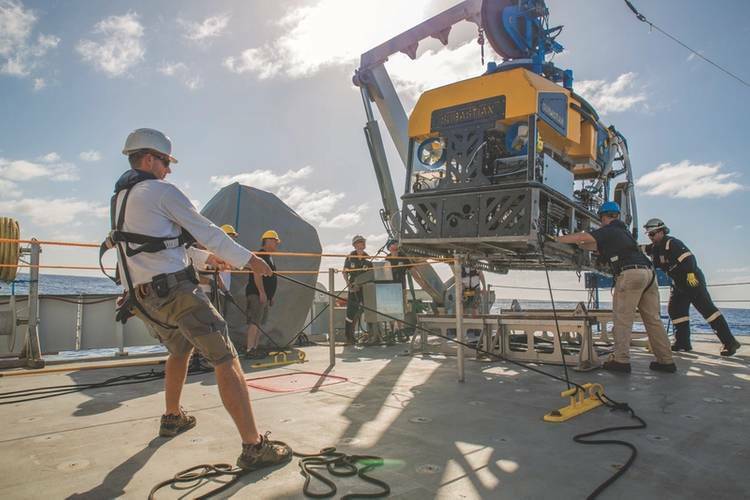 For that, we needed an ROV,” explained Dr. David Butterfield, JISAO, University of Washington, who led the return journey in 2016, along with Dr. William Chadwick, as part of the second phase for the Back-arc mission. 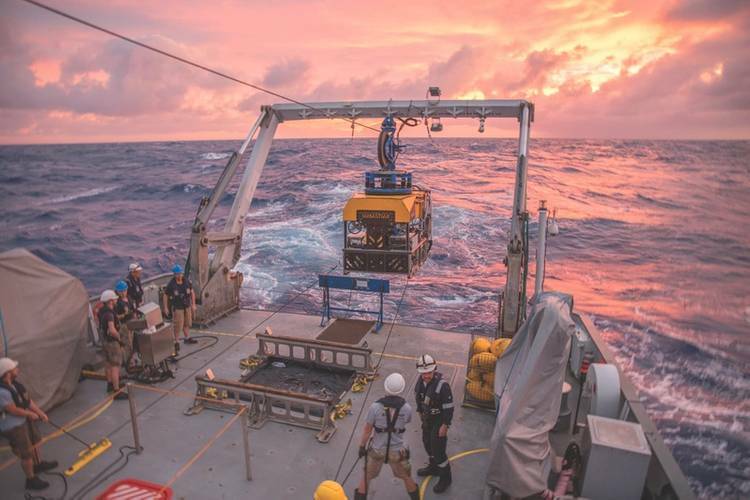 The multidisciplinary team of leading geologists, chemists and biologists aboard Falkor returned with the new 4,500 m capable remotely operated vehicle (ROV) SuBastian, to visually explore and sample the vent sites discovered during the previous cruise. The data collected during the first phase was used to create a map of the area. Now, scientists will combine the map with biodiversity data collected during the recent cruise to better define the relationships between geologic setting, chemical environment and biological communities. The return to the Back-arc was the debut scientific mission for the newly built ROV SuBastian. 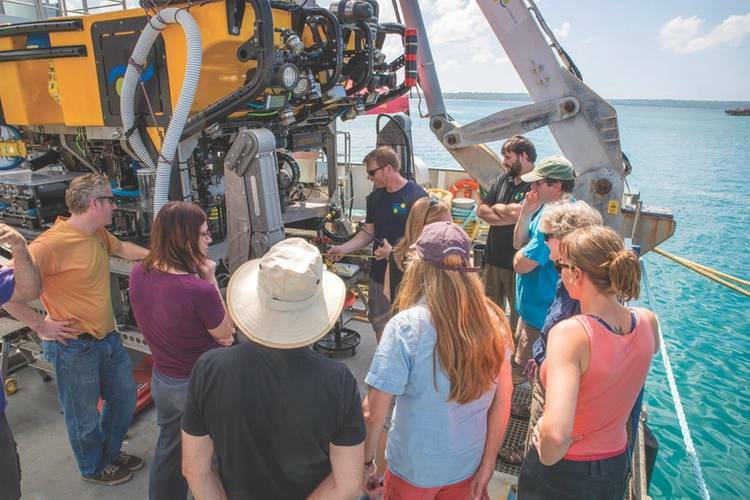 SuBastian was outfitted with a suite of sensors and scientific equipment to support scientific data and sample collection, as well as several cameras, including a high definition 4K video camera. 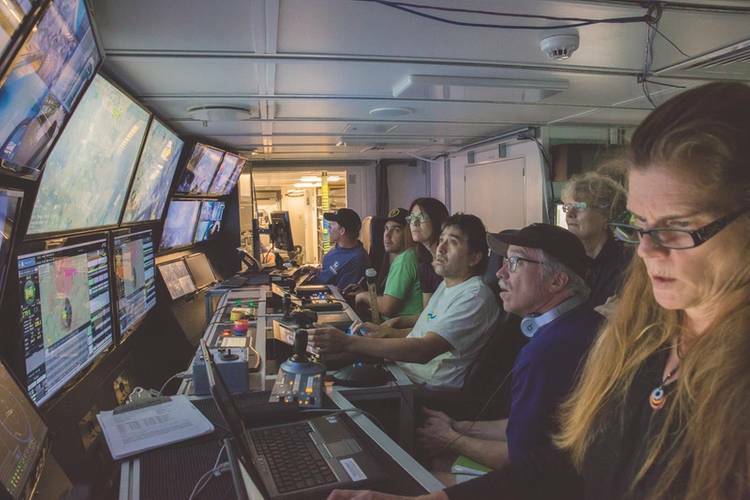 The Schmidt Ocean Institute was eager to give SuBastian and Falkor the capability to stream live footage on YouTube, sharing the experience and data, with the entire scientific community as well as the public. The organization believes that open sharing of information is critical to advancing the pace of science forward. As such, they plan to live-stream all ROV dives in perpetuity so these videos can be used as a data set. Students also have access to videos in the classroom through a newly developed lesson plan to learn how to do scientific video annotation. It took two hours for SuBastian to reach the Back-arc seafloor at depths greater than 3,500 m. On arrival at the new vent sites scientists, along with a YouTube audience of millions, discovered spectacular chimneys made of sulfide minerals, some up to 30 meters (100 feet) tall, and hot fluid gushing out at temperatures up to 365°C (690°F). The study also confirmed that the Back-arc ecosystems are distinct and different from the nearby Volcanic Arc hydrothermal ecosystems, perhaps supporting the idea that geological and chemical environment play a key role in selecting animal community composition at hydrothermal vents. Throughout 2017, the team will continue to analyze the data and samples collected during the most recent expedition with hopes to advance research on how life thrives on these extreme deep-sea hydrothermal vents. 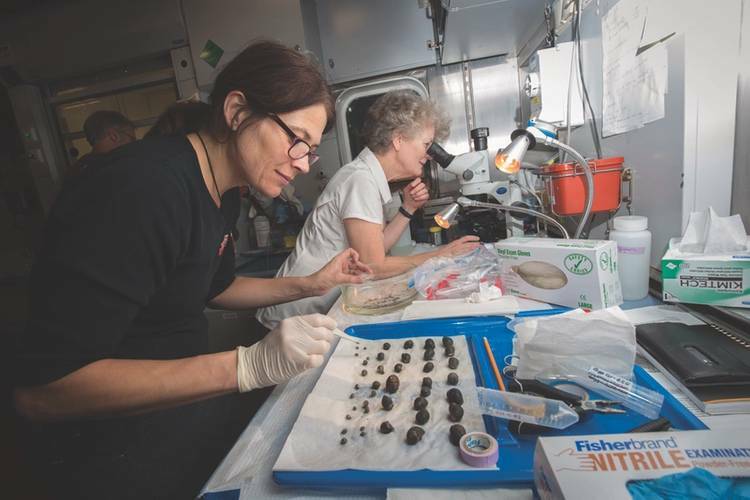 “We’ll be analyzing the data and samples collected during the cruise for many months and probably years, then we’ll be using those data to write scientific papers to share the results of our research with the broader scientific community and to the public. Eventually, this may lead to new questions and new research in the Mariana region,” Chadwick concluded. SuBastian runs on 100 percent Greensea controls, including the OPENSEA operating platform, and in its first science dive had .005% downtime on over 200 hours subsea. Greensea has been included on all of SuBastian’s dives so far, and the company recently signed a deal to support SOI’s work in 2017. - Dr. William Chadwick, NOAA-PMEL and Oregon State University.